A recent blog post focused on my maternal great-grandmother Mary Susan MORRIS‘s family–our native american heritage through the Morris branch–and the freshly fallen bricks of a wall I had been up against for years. Not abandoning this wall, but continuing on, I returned to my maternal great grandfather–Grandmother Susan’s husband, John Carpenter Ford’s (1864-1961) family. Similarly, I found myself at yet another brick wall at his paternal grandfather, Henry Ford (1790-1830)–not the infamous innovator of the automobile industry. After searching to uncover more information about my maternal great grandmother’s (Mary Susan MORRIS Ford) family, I once again stumbled and fell upon freshly fallen bricks of a wall I had pushed against for many years. Until now, I primarily had focused on the origins of my Native American heritage through the Morris branch. And then, I immediately shifted my center as a result of revisiting my earlier research in Grandmother Susan’s tree. To refresh my memory, I reviewed data I had compiled about her father, Gideon W. Morris–my second great grandfather (1837/8-1880)–Virginia born and raised. 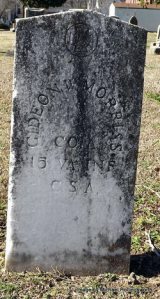 It was about 18 months ago when volunteer contributor Michael Hollingsworth first created a findagrave memorial page about Gideon W. Morris and I added his entries to my tree. My newest research, based upon Michael’s findagrave.com page, has helped me remove some significant bricks from my Morris Family wall–thank you, Michael. My mom has told me a story about my relationship with my Cherokee maternal great-grandmother, Mary Susan Morris Ford, ever since I was old enough to talk. Unfortunately, I was only 14 months old when Grandma Susan passed at 73 years old. The story goes like this. My great-grandmother went to sleep one night and when she … Continue reading You Little Dickens! Reflections my Past Labor Days When I reflect on the meaning of Labor Day from my childhood years, I think: end of summer; back to school tomorrow; our family get-together's that always included outdoor picnics; softball, badminton, and other games; watermelon, potato salad, hot dogs, hamburgers, fried chicken, ice cream, and cake. And, in my … Continue reading Why do Americans and Canadians Celebrate Labor Day?